The term supergroup is bandied around way too often, I’m guilty as charged, but Nolatet fits the bill in more ways than one. 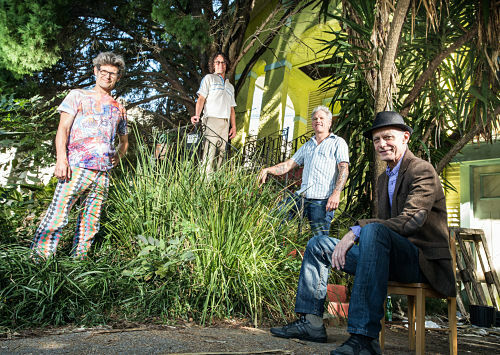 The band features New Orleans stalwarts Johnny Vidacovich on drums and James Singleton on bass as well as Brian Haas on piano and Mike Dillon on vibraphone and percussion. Their debut recording is out today on Royal Potato Family and they play Snug Harbor on Sunday before embarking on a national tour. Though the band is new, the four musicians have collaborated on various projects throughout the years. For New Orleans readers, Haas may be the wild card. He is the longtime leader of the Jacob Fred Jazz Odyssey and a musician as iconoclastic as his collaborators. He is also no stranger to New Orleans having played countless gigs including rare solo appearances at Snug Harbor. Dogs was recorded at Esplanade Studios, a relatively new room in town that has become the go-to facility for improvising musicians. For this album, the spirit of creative expression was the guiding force. It was recorded over just a single day and all the songs were either the first or second take with no overdubs. For longtime New Orleans contemporary jazz fans, one of the standout cuts is “Bongo Joe,” a timeless Singleton composition, which has become a modern New Orleans standard. Hearing this tune, which has been a staple of Astral Project, Singleton and Vidacovich’s long-running band, with the addition of Dillon’s vibes is downright eerie in the best possible sense. Haas is known for his eclectic approach to songwriting and his deft touch on the keys. Here, he plays piano exclusively eschewing any electric sounds. The title cut, from his pen, positively oozes with musical charisma with gentle breaks giving ample space for the rhythm section to shine. “There’s No Fire,” another standout cut, is credited to all four musicians and appears to my ears to have been written on the spot. Singleton contributes strong work on the bowed bass while Dillon and Vidacovich communicate telepathically on various percussion instruments as Haas gently twinkles the keys. When Dillon switches to vibes, the whole tone of the song changes. Before it’s over, it’s almost like a suite. I can’t wait to hear it live. Sets on Sunday night at Snug Harbor are at 8 and 10 PM.